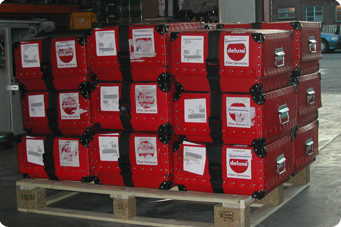 National Film Transport provides a "secure release" service accross the UK and including Southern Ireland for film releases. All copies are individually barcoded and tracked from sortation (at our secure facilities at Slough) through to safe delivery at each cinema. All vehicles are GPS tracked and signatures are obtained for each print. The whole process is FACT accredited. A dedicated co-ordinator will liaise with the client throughout the process, giving updates on progress and dealing with any issues which arise. A list of "proof of deliveries" will be provided on the completion of the release. Vehicle tracking and signatures are also viewable in real time through our website.